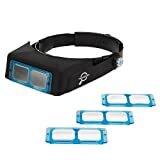 Best Headband Magnifiers 2019 – Tools don’t just help us improve the way we do things and be productive. But, tools themselves improve as well. Magnifier is one good example. Just imagine, we already have handheld magnifying glasses and we are happy about it, right? It helps us see things in a kind of bigger perspective. But there’s one problem, you need to hold it and thus disables one of your hands for work. 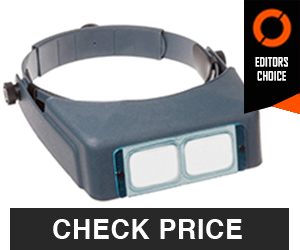 But now, we have these best headband magnifiers. They are better and easier to work with. So, if you are working on small things like sewing, jewelry, and electronic repairs, then you surely need a magnifier. Though obvious, we recommend you get a headband magnifier. Thus, we collate this list of the best headband magnifiers for you. We hope that this will help fasten the search of your head-worn magnifier. Most probably, one of these magnifiers will be in your hands, and in your head. So, without further ado, here’s our list of the best headband magnifiers. 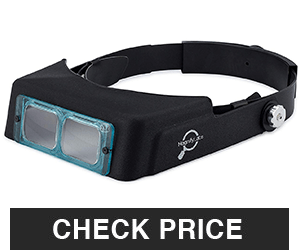 The SE MH1047L Headband Magnifier is a BestSeller under Hobby Tool Magnifiers. Illuminated with Multi-Power LED, this head magnifier is for casual users and serious hobbyists. This has three levels of magnification with a fixed lens, flip-down lens, and flip-down loupe. Both fixed lens and flip lens magnify to 1.9x, while the loupe lens has 4.5x magnification. Altogether, they can be combined to have a magnification power of up to 8.3x. However, the magnification levels may vary slightly as they are just approximated. With its two bright white LED lights, this can also be a headlamp. To power the LED lights, this requires 2 AAA batteries. 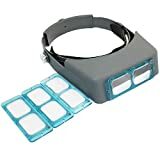 Thus, for everyday use like for sewing and working with small electronic devices, this cheap headband magnifier is a good investment. Part of the Carson Pro Series, the Carson MagniVisor Deluxe (CP-60) is a head-worn magnifier which is ergonomically designed. 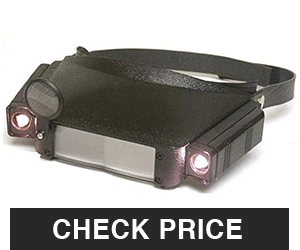 This hands-free magnifier has a LED lamp mounted on top and 4 interchangeable acrylic lenses. Cut with precision, the lenses have 1.5x, 2x, 2.5x and 3x magnification power. The LED lamp has 3 super bright LEDs and is adjustable both horizontally and vertically. The LED lamp uses 3 AAA batteries for power. Moreover, the LED lamp is also removable so it also is a free-standing lamp through its magnetic base. It also works with reading glasses so there no need to remove them. For easy fit with different head sizes, this has an adjustable headband with a quick release button. This is hands-free magnifier is a good fit for jewelers, hobbyists, watchmakers and repairers, and tailors. This is also perfect for everyday use when working with small objects and other low vision tasks. 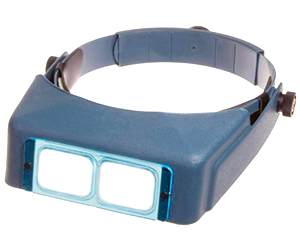 Donegan OptiVISOR is another hands-free binocular best headband magnifier that uses optical glass lenses. For quality and clarity, these optical glass lenses are grounded and polished into prismatic lenses. These are available in multiple dioptric strengths with each providing specific magnification power at specific focal lengths or distance from the objects. This magnifier is good for jewelry works, watch works, needlework, artworks, reading books and electronic works. For flexibility, OptiVISOR features replaceable binocular lenses which are mounted in an interchangeable plastic frame. 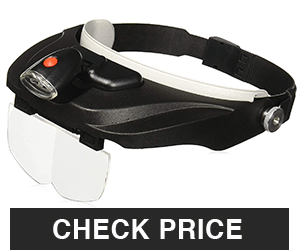 The headband is adjustable just like most of the magnifiers to fit with a range of head sizes. Also, this magnifier works also with prescription or safety eyeglasses. Diopter (D) is a technical term which is the measurement of the light curvature and thickness of a lens. The dioptric number and the magnification number are two different things. Please check on the product page of this product to learn more about which Donegan OptiVISOR is a fit for you. Another headband binocular magnifier from Donegan, OptiVISOR LX features an optical-grade, acrylic lens plate turned into prismatic lenses. Just like the other OptiVISOR above, this is available in multiple dioptric strengths. What’s different with this model, this features a durable, replaceable binocular lens plate, made of optical grade acrylic (model AL-13). All other features are also the same with the model above. MAGNIFYLABS is another hands-free magnifying tool which helps with detailed works. 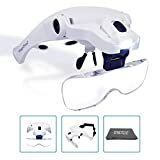 To reduce eye strain and improve vision, this magnifier is fitted with high-quality optical glass lenses. For flexible fitting, comfort and easy use, this magnifier has an adjustable headband and padded leather. 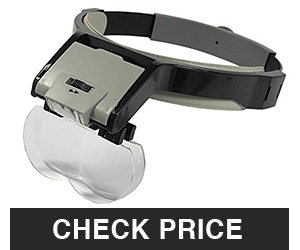 This magnifier is also compatible with safety glasses or prescription eyeglasses. A great fit for hobbyists and crafts enthusiasts which requires magnification. 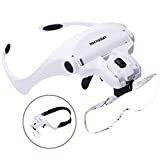 HOUSWEETY head-worn magnifier is another versatile magnification tool which is for professionals like jewelers and watches repairers. Also, use this magnifier at home for everyday tasks like embroidery, electronics repair and as reading aid. This magnifier has 5 interchangeable lenses with different magnification power and focal ranges which are 1x / 24″, 1.5x / 15″, 2x / 7-11″, 2.5x / 6-10″ and 3.5x / 4-7″. The materials of the lenses are high-density acrylic for clarity and surface-hardened to protect from scratches. To add flexible and ease in use, lens flips up when not in use. 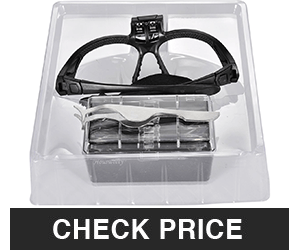 Different from other magnifiers, this magnifier features an eyeglass frame for quicker use. There is also an elastic headband for a more secure fit in heads. 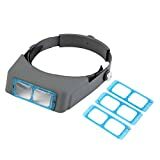 Beileshi magnifier is another head-worn magnifier. However, it physically looks very much identical with the HOUSWEETY magnifier. Wear this magnifier just like an eyeglass. But for a better and secure fit, it can convert itself into a head-wear through its attachable headband. Another entry here for SE, this head-worn magnifier has the dual acrylic lens with LED lights at the side. Made to be handy and secure with its straps for the back of the head. This intended for a variety of purposes like for hobbyists, jewelers, and repairers. Different in form with the other two SE magnifiers, this Illuminated Multi-power head magnifier is a great upgrade from the other SE models. Designed for serious users, this magnifier offers several lenses to suit the needs of its users. The lenses can even be stacked together to increase the magnification power. This comes in with plenty of useful features which are flexible to different users. 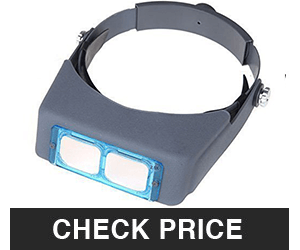 GXG-1987 is another choice for consideration when looking for a headband magnifier. It has 4 replaceable lens plate with different magnification powers. Although, there are no lights which will have been added plus points for this magnifier. Don’t let excitement get to you first. It’s always good to think before you buy. So, before you choose one you need to carefully consider which features are important to you. Are there specific requirements you need to have like the magnification power? 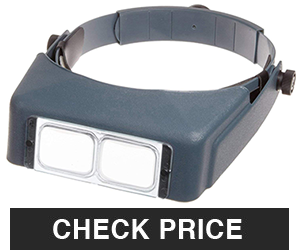 Or, are you looking for the cheapest headband magnifier or you want to have an expensive one? Think through all of the requirements you need. As a good start, create a list and then examine each magnifier here to see which ones fit your needs. We have this list which hopefully could help you. This is the most important feature that you should consider. Why? First of all, this is the main purpose of why we need this product. Also, think about your level or grade of your eye vision. This will come in very much helpful for different kind of works you will be doing. Not only that, but this will allow also other users in your circle like family members to use the magnifier based on their magnifying needs. Are you wearing an eyeglass? If so, then check if the magnifier still works fine with the user wearing an eyeglass. And the best, a user can still wear the magnifier with or without an eyeglass. Who knows, you might want to let anyone in your family wear it too. If you are particular with this, then this is also a good thing to look at. There are lenses which are made of plastic. Some are made of glass and acrylic. Of course, lenses crafted of glass or acrylic are better than those made of plastic. The fit part is usually part of the features of these magnifiers. Makers know that heads have different sizes so this is definitely taken cared of. But with comfort, you need to check the material used for the headband part of the magnifier. This could be made of plastic or this is could be a strap. 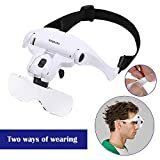 Since you will most likely be wearing this while working, make sure you will be comfortable with the magnifier in your head. Some magnifiers don’t have led lights. 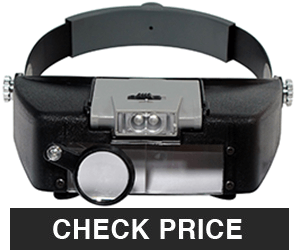 So, if you have to work low lights or night, then consider a magnifier with LED lights. Fortunately, most of the magnifiers in this list have bright LED lighting modules. To wrap up, we wish that this list of best headband magnifiers will help you to where you’re first or next magnifier. What do you think of this list? Let us know. 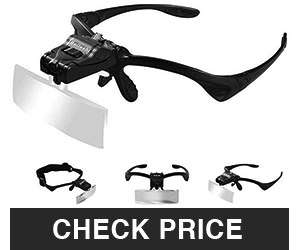 Lastly, we hope that you can find the right head-worn magnifier which fits your head and needs.